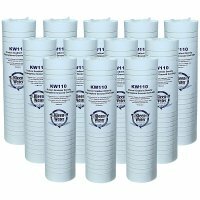 These water filter cartridges resemble both the appearance and performance of the EC110. 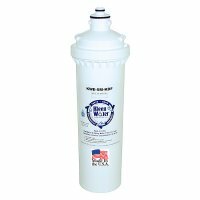 The rigid poly filter replacement cartridge closely spun construction effectively removes dirt and sediment with impressive flow rates of up to 8 gallons per minute. Each cartridge contains two distinct micron layers. Larger particles are trapped near the exterior and progressively finer particles towards the filter core. Thus the cartridge has exceptional solids-holding capacity and will perform longer. The raised groove design optimizes the dirt holding capability resulting in longer cartridge life. These replacement cartridges are an ideal choice for the value conscious consumer. Performance is commensurate to the competition at a fraction of the cost. Grooved Gradient Density ~ Melt Blown Polypropylene Construction ~ Shrink Wrapped for Purity ~ Flow Rate 8 GPM ~ Recommended Cartridge Change Every 4 Months or Upon Substantial Pressure Reduction ~ Materials are NSF Certified. 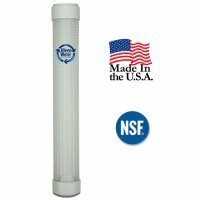 The industry universal dimension of 2.5 inch x 9.75 inch makes it compatible with filter housing manufacturers such as GE, Culligan, Cuno, Omni, Kenmore, Whirlpool and Ametek, among others. The smaller the micron rating the better the entrapment capability.